Did you know that about 3 billion pizzas are sold annually in the U.S.? That's a lot of dough, sauce, and TOPPINGS! 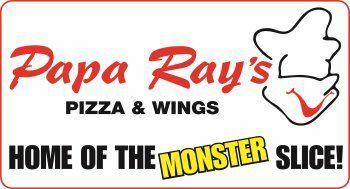 When it comes to toppings, Pappa Ray's Pizza and Wings doesn't hold back. This Logan Square pizzeria loads their pies with the freshest ingredients and only serves the best! Meat lovers wont be disappointed with our juicy sausage and pepperoni. Not big on meat? Veggie heads will obsess over the quality of our peppers, mushrooms and other vegetables. So treat yourself to a night out at one of our Chicago-land pizza locations and give your taste buds a kick in the mouth! Craving more? Check out our combo deals and promotions. With these offers, Glen Ellyn pizza lovers will be begging for more.